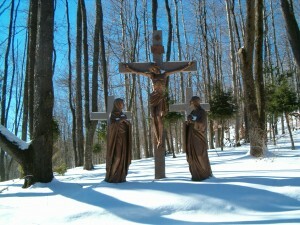 The Stations of the Cross is a prayer that facilitates union with God through the passion of Christ. Traditionally, it is a devotion practiced largely by Catholics, particularly on Fridays during the season of Lent. Over the years we’ve come to appreciate this devotion as being far more than a simple recitation of prayers. In our healing practice, we’ve discovered how the Stations of the Cross provides a means through which people can unite their suffering to the suffering of Christ and find healing for the wounds that are often the underlying contributing factors to their addiction. At St. Joseph Institute, we find that people of all Christian denominations are attracted to our Stations of the Cross trail. It was designed and created as a place of refuge for those who suffer, as well as a site to commemorate the passion of Christ. Each of the fourteen Stations is marked by a seven foot hand-hewn cross with an image of the scene for that Station. The crosses were made by retired carpenters in West Virginia, and the sculptures were imported from Italy. The fourteen locations of the crosses form a trail that allows visitors to walk from Station to Station as Jesus walked the Way of the Cross on Good Friday. This particular set of Stations is intended to offer aid for those who are addicted and in need of finding a solid foundation in recovery. Each Station has a theme that helps the reader understand the process of addiction and/or discover how to initiate healing and recovery. The general theme is discussed in the first few paragraphs, followed by at least one story that illustrates some aspect of addiction or addiction recovery. The stories encourage the reader to identify with the main character. Through this process of identification, you can be honest about your own addictive behavior patterns and learn to overcome them through a closer relationship with God. As you engage in the Stations, remember they can be used to: (1) identify the issues that contribute to your addiction, (2) help you acknowledge the weaknesses associated with your addiction, and (3) help you discover the strengths that will cause you to be more stable in your recovery. Stay tuned to this blog in the following weeks as we go over each Station in more detail.